The kitchen is such a central part of the home design: a place where you, your family, and your friends naturally gather for socializing over the preparation and sharing of a meal. It is the figurative heart of your home, where the warmth that makes an empty house into a family living space radiates from one central location. With this concept in mind, Armony Cucine created the Diadema kitchen to make the figurative warmth into a literal interpretation of how the cuisine is visually designed. Natural oak panels with a serrated finish have the rich rustic texture but the sleek design of a contemporary piece of furniture. Combined with satin lacquer panels, the Diadema kitchen by Armony Cucine creates a constant dialogue between classic features and innovative modernity. The natural wood finishes in shades of beige and chocolate create a warm, rich environment with a homey touch, without sacrificing on cutting-edge style and storage solutions. 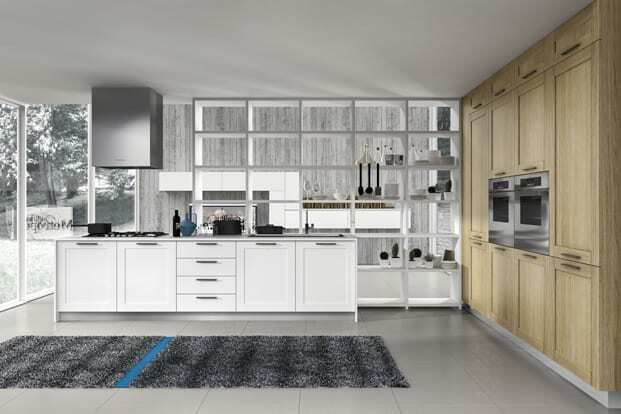 The Diadema kitchen can be configured to fit snugly along a wall in a small galley with integrated ovens and a refrigerator built directly into the cabinetry. Open shelves allow for quick access and display, or help to create a partition dividing a large open floorplan into a more intimate cooking and dining area. An optional breakfast bar and low-profile barstools offer a place to gather close to the action in the kitchen, which can feature a large island in addition to the bar. 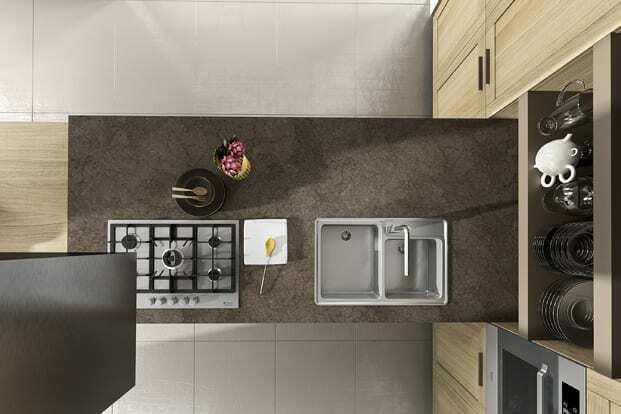 Are you ready to add warmth to your modern home design with the Diadema kitchen?